We are honored to announce our two recent accomplishments! The master bathroom pictured above by Aleto Construction Group has won a national award for a Bath Remodel up to $50,000 in the 2018 Best in American Living™ Awards (BALA) by the National Association of Home Builders (NAHB). Now in its 35th year, BALA recognizes outstanding achievement by builders and design professionals in all sectors of the residential housing industry including single-family production, custom, multifamily, affordable, remodeling, community and interiors. BALA is built on the principle that all great homes start with great design, no matter cost or size. About the project: A St. Louis couple was expecting twins. To prepare for the coming lifestyle changes, they needed help to make their vintage 1980s-style master bathroom more beautiful and functional. They contacted Aleto Construction in their third trimester, so we swung into action to beat the deadline. In the master bath, we removed two angle walls and drywall to access the plumbing. We also removed the Miami Vice-era tile down to the subfloor, which needed repair to support the new toilet and custom shower. We framed a half wall near the toilet and built a new curb for the shower, which featured a linear drain, standard shower head, rainmaker shower head, triple body-spray and handheld sprayers – just the kind of retreat that new parents would certainly enjoy. The clients selected a floating vanity that involved adding a wood backing and reworked vanity plumbing to accommodate the cabinet. We also installed a second wood backing to hang the tracking for their barn door to the master bathroom. 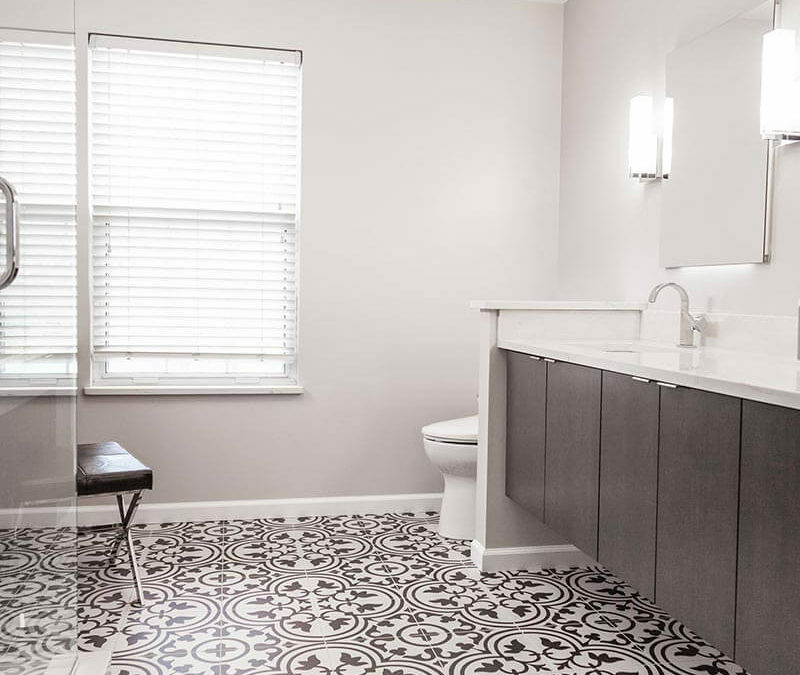 We finished it all off with a beautiful complex tile, modern lighting fixtures and sophisticated plumbing fixtures that completely transformed the room’s look and feel from vintage to vibrant. More information on this BALA Award will be available in February. Stay tuned! Editor and Founder of GC Magazine, Jack Cookson and his team set forth to research the top builders in St. Louis Missouri. They spent months researching architecture and interior design in St. Louis. When considering who the winners of this honor would be Jack and his team considered client reviews and testimonials, previous awards that builders have won, past projects, neighborhoods serviced, scope of work by the Builder, price range of the projects, web visibility and the overall aesthetic of the company. Thank you to our customers who help make rewards like this possible!